We investigate the properties of microcapsules consisting of calcium-alginate and have a diameter of about 1mm. Alginate, which is abundant in the cell walls of brown algae, is a copolymer of the saccharides mannuronate and guluronate. In the presence of divalent cations like calcium it forms stable membranes. These capsules can be used for transporting drugs with food. Hence it is important to study the diffusional processes through the membrane. For this purpose, we use pulsed-field gradient NMR and diffusion-weighted MRI at 600 MHz. Another property of interest is the thickness of the capsule membrane. This property can be investigated by spectroscopic imaging and NMR microscopy. The picture on the right shows an NMR-image of a composite capsule. The inner layer consists of pectinate, the outer layer of shellac. MR Flow Imaging is a powerful tool for noninvasively measuring flow patterns, as well as in vivo and in vitro applications. It offers different methods to precisely measure directions of the flow, acceleration effects and velocity or to just visualize areas of moving spins. 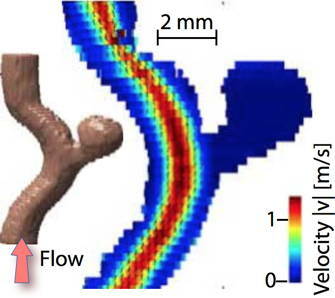 We are interested in the detailed flow behavior of liquids, especially blood, flowing through models of different complexity which simulate human blood vessels. Our 14 Tesla MR imaging system allows us to characterize flow on microscopic scales with resolutions that are much higher compared to common clinical MRI systems. The image on the right shows results of a simple four dimensional phase contrast MR flow measurement, which provides information of the velocity and the direction of flowing water molecules in a system consisting of two twisted silicon tubes. 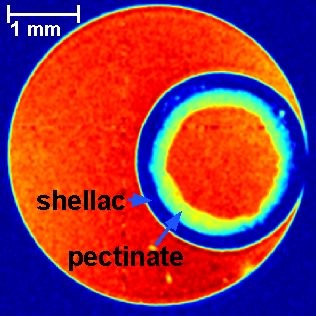 On the right side, the spin density and the observed slice is shown and in the left part of the figure you can see the velociasassel ruptures, which often lead to a life threatening situation of a patient. MR-spectroscopy allows the non-invasive detection of metabolite signals under in-vivo conditions. The concentration of some key metabolites contains important information about critical health conditions. 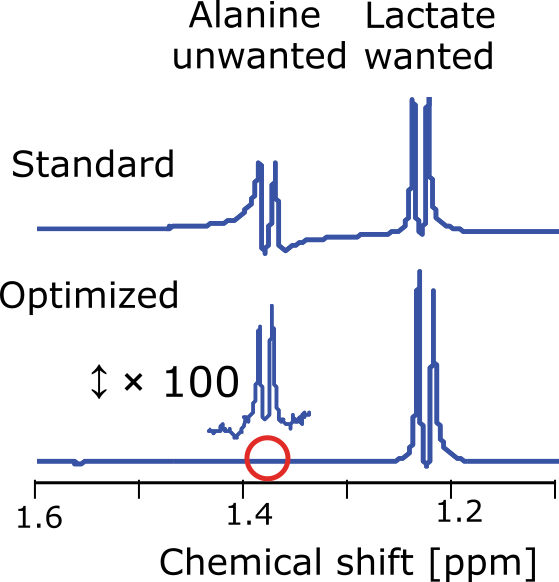 In many cases, selective excitation is necessary to distinguish between overlapping signals and ensure a correct quantification of the target metabolite. Multiple quantum filter sequences can be used to filter signals from molecules with specific coupling patterns. We investigate their performance under non-ideal experimental conditions that are typical for standard clinical MRI scanners. Reliable and robust excitation techniques can be achieved through the optimization of RF-pulses on the basis of optimal control theory. The optimized sequences allow for an improved excitation of the desired metabolite and at the same time effective suppression of unwanted signals. The picture on the right shows an example system where lactate should be excited and alanine should be suppressed. Adding salt to an aqueous solution of t-butanol: Is hydrophobic association enhanced or reduced?